This is a tribute to Tara. She died last night, in a horrible and painful death. No, I am just kidding, but she deserves some additional thanks. She says that she doesn't need the "thank you's", and the little compliments, but we will keep dishing them out because she works so hard. We eat like kings, because she sweats it out next to a hot stove, in a boat without air conditioning, and sometimes without a breeze. Our Thanksgiving seemed just like the ones at home (minus 20 to 30 people). She found a small turkey breast to roast, mashed the potatoes, and even modified the stuffing packet from the store to match my mom's recipe. There was also green beans, a salad, rolls, and cranberry salsa (a recipe from our sister in law Natalie, that makes the holidays). 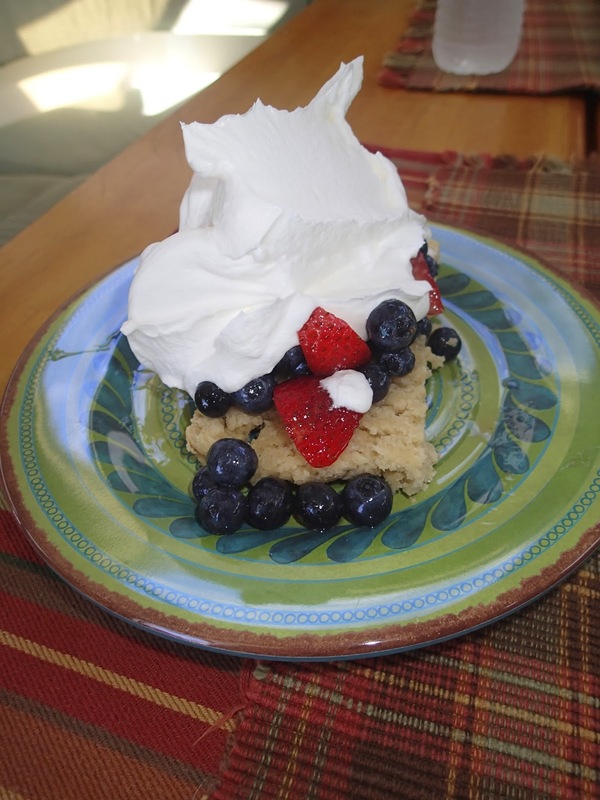 Then, because we ate so much she made the strawberry, and blueberry shortcake the next morning just to top it off. This isn't the only meal that she worked hard on. Right now she is cooking breakfast as she does most days. She has made many good meals from breakfast burritos, to eggs benedict, to french toast made with homemade bread. Then finishes it off by hand washing the dishes. She also keeps the boat clean and organized. It seems that some days she is following us around cleaning up after us. She also hand washes all the laundry. That requires putting some fresh water in a tote, laundry soap, and then stomping it if we aren't sailing to do the agitation for us. Then she wrings out the water, and hangs it all over the boat to dry. She is the hardest worker here, and pulls more than her share of the duties. Thanks again Tara! Love, Preston. I'm not surprised that she does all that! She is.a total rock star! And why have I never heard of Natalie's cranberry salsa?! What?! Ditto!!! Maybe that's why I miss Tara so much, but did you have to give me a heart attack Preston. I'm happy that you love and appreciate her Pres, you two make a great couple. Tara, I am so glad they appreciate all you do. You could hail down some Cruise ship and show their chef how things are done right. I never thought we'd be asking you for recipes, but I need the Cranberry Salsa too. Forget the Conch though. PS Gr. Grandpa often comments that you are a Wonder Woman. Tara really is the best! Missing you guys! Like the old saying goes....."If you want it done right, do it yourself" I guess that's Tara's motto. I'm not going to complain about doing laundry or how rough it is to go get more bread from the store! Tara & Boys, you are all loved appreciated & missed back home! Nice post Pres. Tara is amazing but do your clothes smell like feet? Hey, you guys are missing out. Temp in my car yesterday never got higher than 22 degrees and showed 7 degrees as a low. Tara is always such a good homemaker!!! Im kind of jealous since she is such a good cook!. Your weather definately is nicer than ours even with the wind. Looks like you at Providenciales now. There are supposed to be tons of conch shells around there and a couple shipwrecks. There is a town called Provo on the island. Better stay away from there. The whole island is nicknames Provo and it feels a lot like the U.S.A because it is clean and kept up. Thank you Preston and everyone that commented it was nice to have so many compliments. WOW! Sure know how to make a girl feel special. Like my dad said, I am just a person that likes to do things myself so I know they got done. Plus who else would cook and clean on this boat if I didn't? Preston also forgot to mention that I steer clear of any project that includes fuel or oil!